The first flight under UDAN is expected to start next month, said Civil Aviation Secretary R N Choubey. In order to connect the country’s under-served and unserved airports under the Centre’s Regional Connectivity Scheme (RCS), five airlines, including SpiceJet and an Air India subsidiary, have won bids to operate on 128 routes. The routes will connect 70 airports, including 31 unserved and 12 under-served ones under the scheme — also known as UDAN (Ude Desh ka Aam Naagrik). On each flight, 50 per cent of the seats are capped at Rs 2,500 per seat for one-hour travel. Air Odisha Aviation got maximum number of 50 routes followed by Air Deccan (34) and Turbo Megha Airways (18). 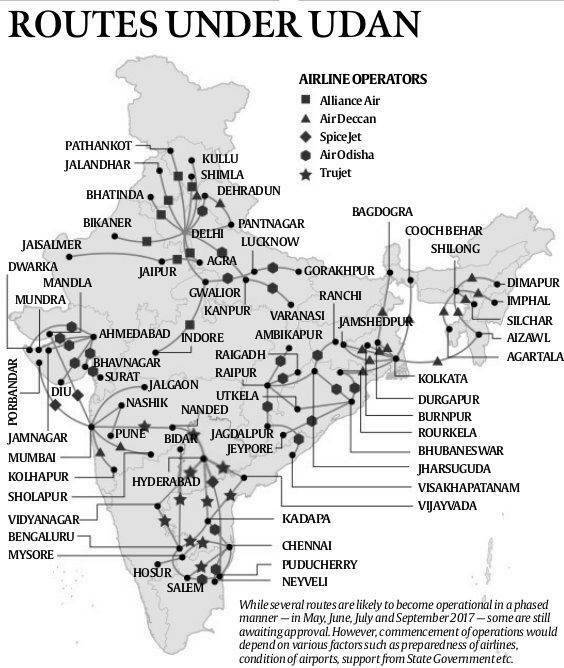 The AI subsidiary Airline Allied Services would operate on 15 routes while SpiceJet won bids for 11 routes. The first flight under UDAN is expected to start next month, said Civil Aviation Secretary R N Choubey. Announcing the names of winning bidders and the routes, Choubey said 128 routes are being awarded to a total of five operators. The carriers will operate 19-78 seater aircraft. These flights would connect airports spread across over 20 states and union territories including Punjab, Uttar Pradesh, Madhya Pradesh, Maharashtra, Andhra Pradesh, Gujarat, Himachal Pradesh, Karnataka, Tamil Nadu and Puducherry. The airports that would be connected under UDAN include Bhatinda, Shimla, Bilaspur, Neyveli, Cooch Behar, Nanded and Kadapa. On each flight, 50 per cent of the seats would have a cap of Rs 2,500 per seat/hour, Choubey said. Under UDAN, the operators would be extended viability gap funding — for which money is partly raised through a levy of up to Rs 8,500 on flights operating in major routes like Delhi and Mumbai. The viability gap funding amount is estimated to be around Rs 205 crore per annum for the operators chosen in the first round of bidding, Choubey said. When asked how the amount of Rs 205 crore could translate to in terms of increased price on fliers on the major routes where the levy is imposed, Choubey said it would be around “Rs 50 per passenger. “That is the ball park figure which is less than 1 per cent of average ticket price,” he noted. Further, Choubey said airports coming under this round of UDAN are in “ready to fly or nearly ready to fly conditions” and the next round of bidding would commence shortly. Minister of State for Civil Aviation Jayant Sinha said criteria for selecting the winning bidders was based on the level of viability gap funding each of them sought per seat. The viability gap funding would be in place for three years for the airlines concerned from the date of starting operations in a particular UDAN route. The scheme also provides for various benefits including no airport charges and three-year exclusivity on the routes. SpiceJet’s CMD Ajay Singh said the airline would not be availing viability gap funding. Amber Dubey, Partner and Head of Aerospace and Defence at KPMG in India said timely payment of viability gap funding to the operators would be key to sustainable operations. “AAI must install fool-proof monitoring mechanism to ensure no undue delays happen,” he said. The Ministry and regulator DGCA should also allow sharing of licensed crew among the operators in order to reduce the cost of operators. Responding to a query about some airlines shutting down in recent times, Raju said, “some airlines have crashed, some are alive”. Referring to the new operators under UDAN, the minister said, “I guess when we start anything we don’t move prophecies of doom… We wish the airlines here will be serving the Indian skies”.